The Black Canyon or (Gunny Gorge) is an impressive scar in the land in Western Colorado. 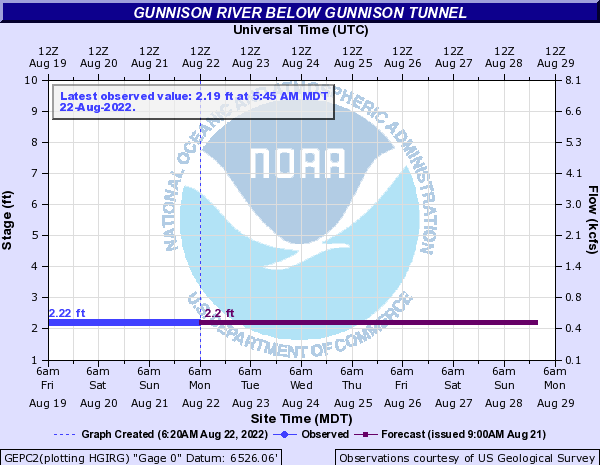 The Gunnison River has slowly dug this ditch to around 2000 Feet deep. The Black Canyon (above Chukar Trail) section is committing and makes for a wild adventure for the expert kayaker. Portages are tough and most drops have must make moves to avoid sweepers and other nasty features. For those that make this trip though it is a trip of a lifetime for most. The Gunny Gorge section (below Chukar Trail) is a classic class III overnight trip, with one of the most difficult sections simply being accessing the river at the bottom of the steep Chukar Trail. Since this section is dam controlled you can find flows year round. Lower flows will make it more bony and harder and high flows will make it really pushy and sketchy. The section below the National Park boundary (Gunny Gorge) is not as committing as in the park (Black Canyon). Mainly a class III run but still committing due to the remote nature. The listed rapids are all in the Gunny Gorge section. Take Highway 50 east out of Montrose CO then turn north onto Highway 347 and follow the signs to the park entrance. Once inside the park follow the east portal road down from the rim to the river. Put in down here. Make sure you obtain a permit from the rangers as well as pay the fee when entering the park. Take Falcon Road east from Highway 50 just south of Olathe. You will need a 4WD high clearnce vehicle to get here. This access point also requires you to haul your boat and gear out of the canyon and up the Chukar trail. Otherwise you need to continue to float down to the north fork confluence. Where the North Fork meets the Gunnison are 2 access points. The main BLM one and a private business (Pleasure Park - fee required). Run left of the large center hole or rock depending on flows. Recognized by a small vertical cliff on right and a prominent rock slide on left. Narrow slots at low flows. Large holes at high flows (>2000 ft). The canyon narrows again at a rocky rapid requiring technical boating skills. This used to be a Class IV rapid. Flooding in August 2010 altered the hydraulics, making it less difficult. Recommend scouting (left), as it is unknown what effects high flows may have on the rapid. Best run on left with ferry back to the right. A straight run through with nice waves. The last designated boater camp is located on the right above the rapid. Pushes boats toward the cliff wall on left. Immediately below S-Turn. A deceptive, rocky rapid that has wrapped rafts and pinned kayaks. Most common run is through the narrow slots river right. Contains many large holes and narrow slots. Very technical with large holes and two narrow slots. Most run right slot avoiding cliff on left. Run left of large boulder and finish right avoiding large hole on left. Watch out for the lateral wave! Requires navigating a narrow slot either center at higher flows or left against the cliff at flows below 600 cfs. The last named rapid; stay right and avoid rocks on left.